As an Etsy seller it is hard to know what storybook characters are copyrighted and which are not. Added to that is the fear that Disney will come after you hard if you are using one of “their” characters in your designs, titles or tags. This post is an overview of Disney Copyright, combined with a list of storybook characters you can use in your designs “legally” because their copyright has expired and they are in the public domain. According to the Copyright.gov website, copyright lasts for the life of the creator PLUS 70 years. Super, that makes everything really easy right? Maybe not so much! What about Cinderella and Aurora who were made into Disney movies? Does Disney have “dibs” on those characters? What about the Beauty and the Beast franchise, that they just rebooted with a full blown movie… is that their property? Most times you can use common sense to figure out if something is over the line “copyright” wise. Here are some live shot of current Etsy products… can you spot the ones that might have a problem passing the copyright sniff test? 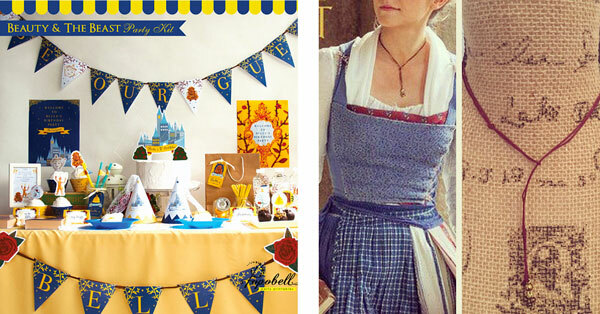 The party package on the left from Popobell is a great example of using the Beauty and the Beast theme without using any of the Disney images. It has castles and vines and Belle, but nothing that steps over the line to annoy Disney. The one on the right has a picture from the movie… sigh. 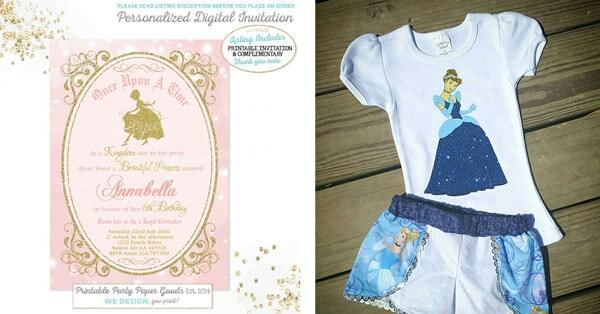 Now, they may have gotten permission from Disney to use that picture, but I doubt it. Instead they are “stealing” the popularity of a specific necklace from a specific scene of a movie. Here are a couple of examples from Cinderella… which do you think is okay? The shop on the right is using the EXACT images from the Disney movies. Now I KNOW they will say that they are using that fabric, but the license is with the company that manufactures the fabric, not with someone who makes a product from the fabric. Buying a product with proprietary images doesn’t give you the right to use them for something for commercial intent. 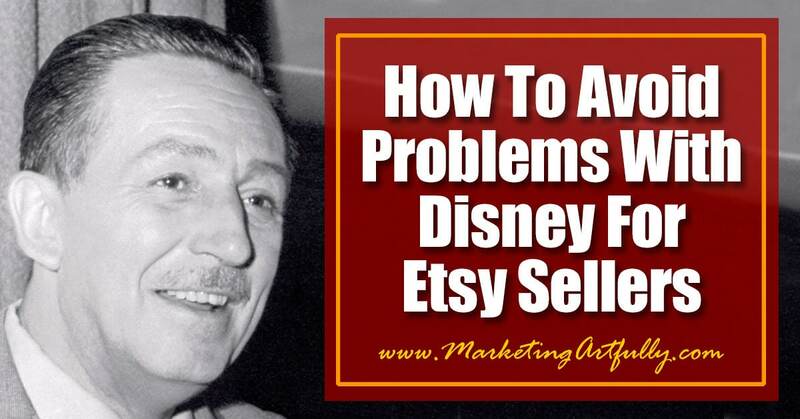 Before you get all sanctimonious about “First Sale Doctrine” (meaning that buying the fabric is the “first sale” and you SHOULD have the right to use it to make products to sell), Etsy will not take the time to research all of this and you probably don’t have deep enough pockets to fight Disney if they contact Etsy about your shop. Related Post :: Should You Offer Free Etsy Shipping? How Is Disney Changing To Fight The Stealing Problem? 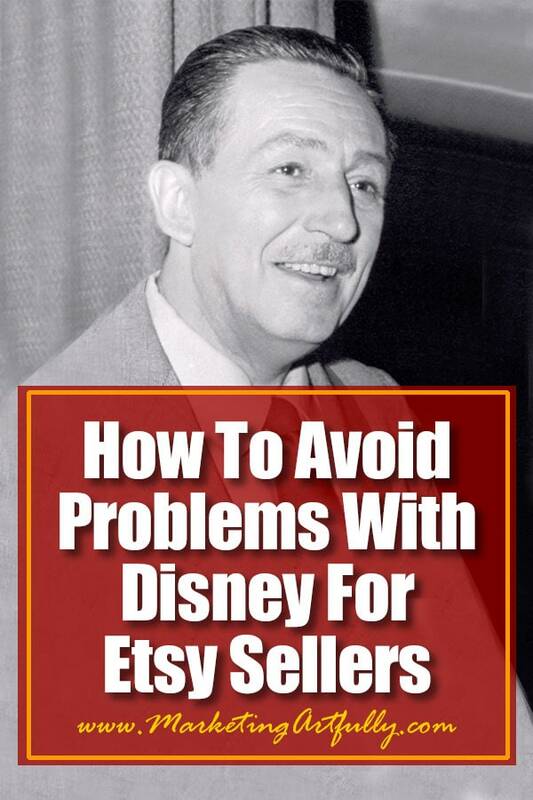 In doing my research for this article I found a great post on Quora about how Disney is now handling this problem. For example, they rebooted Rapunzel as “Tangled” and did The Snow Queen story as “Frozen”. You are able to use ANY of these names and themes. You just cannot use any of the specific imagery or new parts that Disney specifically added. As you start making products that are based on these stories you might want to get a bit of inspiration (that won’t get you in trouble). 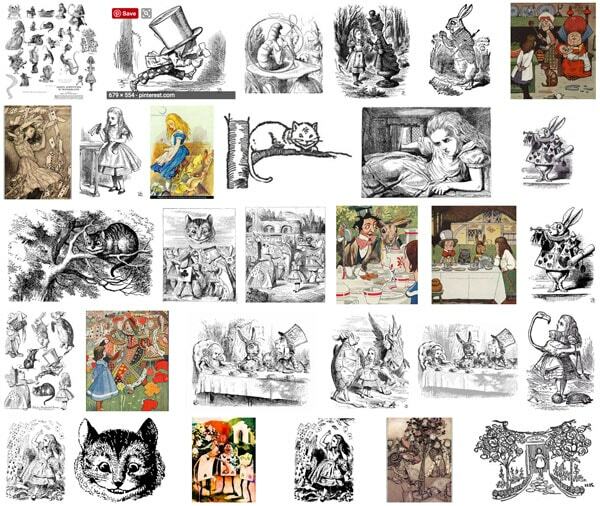 To find images for this you can do a search for “public domain images of alice in wonderland” or any other story. 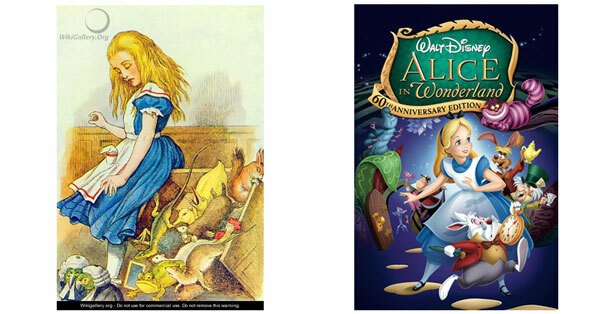 Disney actually based their Alice on the classic version so you would probably be okay making products based on the “classic” version that would match “new” Disney Alice colors. In 2024 Mickey Mouse will leave Copyright protection… YAY! But only the old versions… BOO! It seems like some sellers are super excited that Disney will be losing some of their copyright protections in the coming years. This is true, but only for the older versions of Mickey, not the current day, colorful character we all know and love. As changes in his look occurred over the years, these will roll out over the the years. Losing their copyright doesn’t mean that Disney will allow a free for all using current Disney characters that will not actually be in the public domain legally. A fun note about trademark though! I immediately thought to myself, well trademark will protect them, but that is not totally true. This has been brought all the way to the Supreme Court in Dastar Corp. v. Twentieth Century Fox Film Corp.
Twentieth Century Fox, which had owned the television rights before they expired, sued Dastar arguing that Dastar had violated trademark law by passing off Fox’s work as its own. But the Supreme Court rejected that argument, noting that allowing the use of trademark law to restrict the republication of creative works would create “a species of mutant copyright law” that limits copying of public domain works. It is funny, I hear Etsy sellers screaming all the time about how China sellers are stealing their designs while at the same time they have Disney pictures and inspiration on their own products. Copyright protects you just like it protects Disney. Copyright starts at the time of your first publication of an image, piece of writing or work of art. You don’t have to do anything to get this protection it is automatic. Now, defending that beyond just reporting it Etsy may cost more than you want spend, but it is available to you. If someone steals your original designs or concepts you can report it to Etsy. They will then make a determination about whether they will support you. Now that we have covered your rights, let’s talk about Disney’s rights. I KNOW it is harder to sell non-Disney products because they are so popular. But your job is to figure out how to use the public domain information to make your products appealing to buyers. Inspired by… this one drives me nuts when I see it as an excuse. Sellers will say, “but I am just saying that it is inspired by a Disney movie. That is violating the Copyright act and is going to get you in trouble. Another “sneaky” way that sellers try is “similar”… also not okay! But everyone is doing it… just because all your friends jump off a bridge, oh wait that is my talk with my kids, but kind of appropriate here. It is easy to find other people who are breaking the law every day in many ways. It is not worth putting your business in jeopardy by trying to take the easy way out. Disney Fan Art Policy… let’s talk a wee bit about fan art! Disney fan art is fine to do, of course. What is not fine is SELLING your fan art. I know, you are just trying to add to their company, but they are FIERCE about protecting their copyright and they want to control the products that are put out for their business. You need to get creative with your product development. Do a wee bit of research and find out if something is in the public domain BEFORE you get far into the process. Figure out if some of what is “Disney-esque” is actually based on public domain that you can use without fear. Last but not least be flexible! I KNOW people and companies are trademarking so many phrases and words that knowing what is fair game is a moving target. Just do your best to make sure you are staying in compliance, take down anything right away that violates trademark or copyright and keep producing new great products! Sept 2018 Etsy SEO Update… ack! 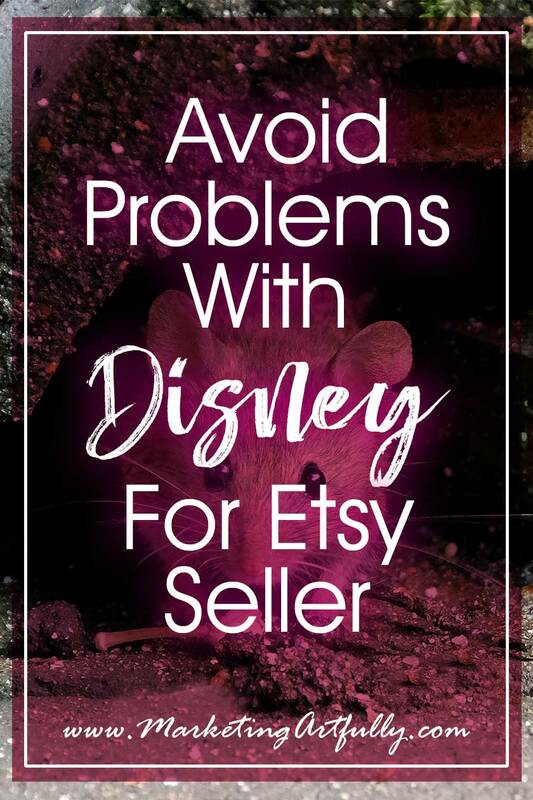 Directly from Etsy… Getting great reviews, having complete shop policies, and adding an About section positively impact your search ranking, while recent cases opened against your shop and intellectual property infringement issues can hurt your search ranking. Not only can Disney request that your product be taken down, but there could be lingering SEO effects even after it is down! I am more of an expert on licensing for photos and written work than Copyright and Trademarks, so here are some great resources I found while writing this! Awesome comment from a reader!